Recently I was in Hamilton, New Zealand, as a clinician at EquiDays, their national horse expo. I met a lot of great people there, including three talented horsewomen, who were demonstrating their skills in a colt-starting challenge. I was the emcee for the event, explaining what they were doing in the three round pens, as I fielded questions from the audience. 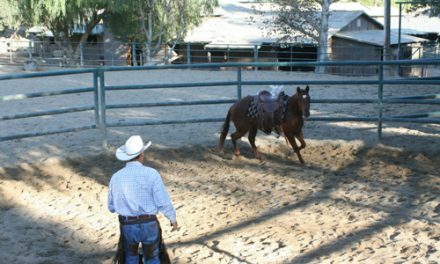 Young horses are very impressionable, and the younger they are, the more impressionable because their brief life experience has not yet led to ingrained learned behaviors. Also, horses are very fast learners, at any age. They learn much faster than humans—for better or for worse. These two qualities together mean that it is very easy for young horses to learn the wrong thing. Very easy. For instance, foals are very tactile and love to be scratched, rubbed and cuddled. In their enthusiasm, foals will learn to lean into the pressure they get when someone scratches them. The more handling they have, the more ingrained it becomes in the foal to lean into pressure and to disregard the personal space of the handler, while demanding his scratches. While this might not be a problem when the foal is a month old, when it is 800 pounds and leaning into you and crowding your space, it is not so cute any more. 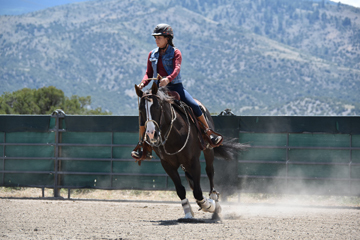 Beyond the safety and respect-for-space concerns, everything that you will later do in the young horse’s training under saddle will require it to move away from pressure, not into it. 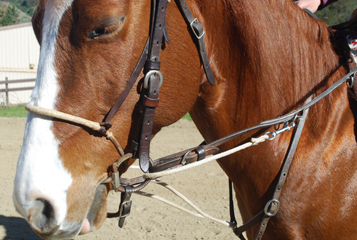 Over-handling and desensitizing a young horse can cause big problems later on when you expect it to be sensitive to cues, responsive to your aids and attentive to you. I remember when I was in college and working on a racehorse breeding farm. We foaled about a dozen mares each year and the foals had very little handling except to be halter-broke when weaned, then started under-saddle as a long-yearling. Otherwise, they were turned out with the herd to romp and play and learn the manners of the herd. We had some neighbors that had adopted an orphan foal—the classic recipe for over-handled and spoiled horses. I’ll never forget going over to check in with them a month or two later, to see their “pride and joy.” I was stunned at how many mistakes they had made in such a short time. The colt was turned out in a big pen with its adopted uncle. Both horses were at the far end of the pen when we stepped inside the gate. Immediately the colt’s head came up, ears perked forward, and he came running straight towards us at a dead run. Humorous at first but the closer he got, the less cute it was. Right before he ran into us at full speed, he slammed on the brakes, wheeled a 180 and backed his tail right into the owner, pushing her back into the fence. She sheepishly smiled as she started scratching the foal’s rump to satisfy his itch (and reward his antics). Can you list all the things that are so very wrong about this picture? Foals can be very shy and tentative, sweet and demur or wild and rambunctious. It depends on the temperament they hit the ground with. While fillies tend to be more docile and colts tend to be more mischievous, these are generalities—and certainly no guarantee. I remember a fine young Quarter Horse colt I raised, from the Dash for Cash bloodlines out of a cutting bred mare. This colt had no longer hit the ground than he was up and about, looking for trouble. He was afraid of nothing and very full of himself. By the time he was a couple months old, he was sparring with any person or horse that he could get close to—rearing, striking, kicking and biting his way through life. Not because he was mean, he was just full of himself. This colt required a bit more training at a young age because of his rambunctious, king-of-the-world temperament. Even though he was a handful, I knew that if that fearless energy could be channeled into something positive, he would be a heck of a horse. And he was. It took some careful and strict attention to good manners and following the rules, but he turned out to be an awesome riding horse. In a memorable episode of Horse Master, I worked with a very similar yearling Thoroughbred filly. Kicking, biting and striking were her favorite modes of expression, and she could sure throw a temper tantrum! Although she was a challenge, she did learn some manners, and once her owner learned the proper way to handle her, they got along much better. Too bad she didn’t get help before the filly kicked out and broke her hand. Whether a foal is a colt or a filly, wild or demure, big or little, it is extremely important that the handling he gets in his earliest years is good and consistent with what will be expected of him later in life. His first learning experiences impress him the most, so make sure you get it right. If a foal learns the wrong things as a youngster, it will be reflected in his behavior and performance throughout his life. Learning boundaries, good manners, self-control, patience, respect for the space of others and respect for authority are critical to a foal’s success, not to mention how safe and pleasant he is to be around. Although foals need good training to have these fundamentals, too much handling is not good for their mental state or behavior. Let them grow up and have a fun youth before too much training begins. Avoiding the common mistakes that amateur owners tend to make with foals can definitely be a challenge. Get all the help and advice you can from reliable sources—you only have one chance to get it right. And check out my new Raised with Manners DVD at http://shopping.juliegoodnight.com for five lessons on foundational training for colts and fillies.